Everyone wants a clear, smooth, youthful complexion. Skin care is the first and most important step in achieving a beautiful and healthy look. 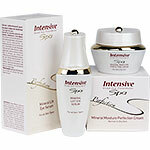 Intensive Spa will help you achieve and maintain a beautiful complexion through natural skin care. Intensive Spa have skillfully combined the unique & natural raw materials of the Dead Sea with the latest advances in skin technology. This innovative range of cosmetic products provides an effective and natural solution for your skin care. Formulated by blending rejuvenating Dead Sea minerals with beneficial plant extracts, soothing essential oils, choice vitamins and collagen, this line offers excellence in natural skin care. An innovative beauty care products that provide an effective & natural solution for your skin care routine. 'Paraben' & mineral oil free, these gentle vitamin & collagen enriched formulas have been created by combining Dead Sea minerals with natural plant extracts. We are proud to introduce Intensive Spa Nostalgia - a beautifully presented line of Bath, Body, Spa & Hair care products, made from choice natural ingredients. Formulated from natural plant extracts, essential oils, vitamins & Dead Sea minerals, the Nostalgia line utilizes the most up-to-date formula & ingredient technologies, but gives you the feeling of times gone by with the beautifully designed 'vintage-style' packaging. The Nostalgia line is 'paraben' & SLS free and has not been tested on animals. T.D.O.T. are proud to announce the launch of the new Intensive Spa Men's line of hair & skin-care products. We have updated some of our best-selling products using the latest in ingredient trends & introduced them in new, stylish packaging that we are sure you'll enjoy. Intensive Spa Perfection is proud to offer a choice selection of their products in Professional Sizes for use in Spas & Salons. This exceptionally high-quality product line, has been packaged in convenient spa-size packaging to enable Spa's and Salons throughout the world to bring the wonders of the Dead Sea to their clients.